His Hero Power is Plague Lord. Join the discussion on our forums! 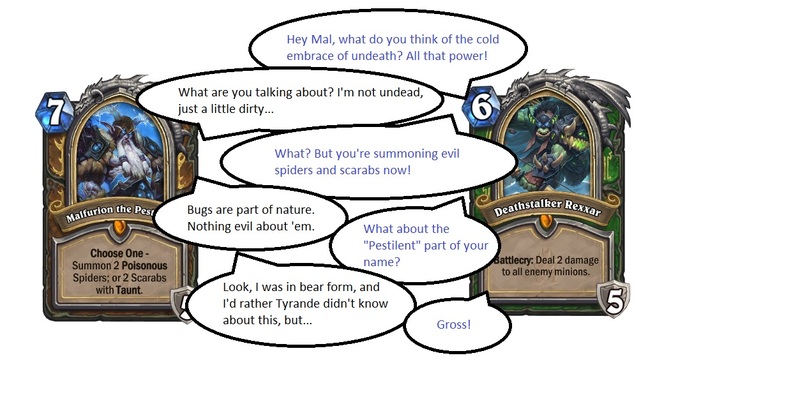 Come discuss Malfurion the Pestilent over in our dedicated Malfurion the Pestilent discussion topic. A 4 mana death knight? Seems good. Knew he was gonna be one of the best DKs from day 1. Such a versatile card. He's not all that special, but he is my favorite card by far. Hero power should philosophically be one attack and three armour [at the same time]. Then again, the effect would not be symmetrical. I don't get why everyone plays this card... It's so bad. Justicar Trueheart was actually better, +2+2 and it was 6 mana rather than 7 and literally nobody played it. Comparing it to Bloodreaver Gul'dan which is 3 more mana but you get both druid effects combined, you don't take face damage when hitting a minion AND you spawn up too 7 demons... This should have both effects combined not choose one and it would still be way worse than the Bloodreaver Gul'dan hero power as it can't bypass taunts and makes you self-SMOrc. +1+1 = 2. 9 mana for +1 is weak. Justicar was +2+2 = 4. It was better. I don't run this in my jade druid and every time my opponents plays this it's a free win because my 7 mana of jades destroys their 7 mana do nothing in tempo and they die before they even get the time to take a breather rather than react to what I did last turn and never even get a chance to hero power. Literally without exaggeration I have not lost a single jade mirror where my opponent played this card. 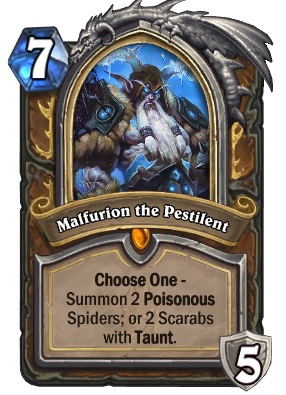 I don't see any justification for this card being choose one rather than both effects like Malfurion (power wise) obviously they only did it to keep up with the druid theme but they highly undershot. 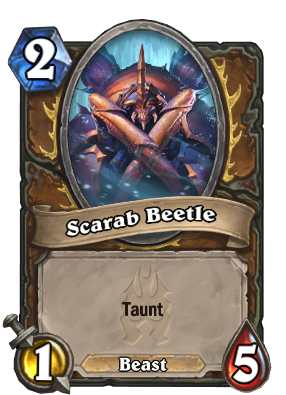 They're the same hero power but one is two times better base stats and then add the taunt bypass and the no self-SMOrc and it becomes objectively at least 3-4 times better. And like I said in my original comment, I've got no idea why everyone plays it. But my best guess is that they're all net decking noobs who are too scared to change even one card in the deck they copied off a stream. 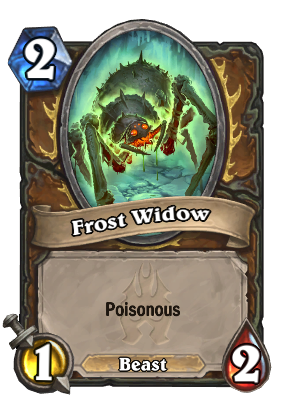 They probably saw some streamer testing this card and ran with it. Second guess would be that they're enveloped in the hype of death knights that are incredibly good like Frost Lich Jaina and so they overestimate the power of this card because "hey, it's a death so I guess it's gotta be good by definition, right? ¯\_(ツ)_/¯ "
Actually scratch that, I'd say those are the two different groups that play this card. The neck decking noobs who don't have the confidence to change anything out of 30 cards and the people who overestimate it based on it being a death knight. Unpacked this from today's free packs, but I hate druid, is there any chances this is getting nerfed to a full price de? Incredibly strong, in a vacuum easily the strongest Deathknight. Will probably always be relevant in every druid deck that isn't hyper aggro.